The charred remains of a home where three people died in the early morning hours on Sunday, July 21, 2018, in Mission. 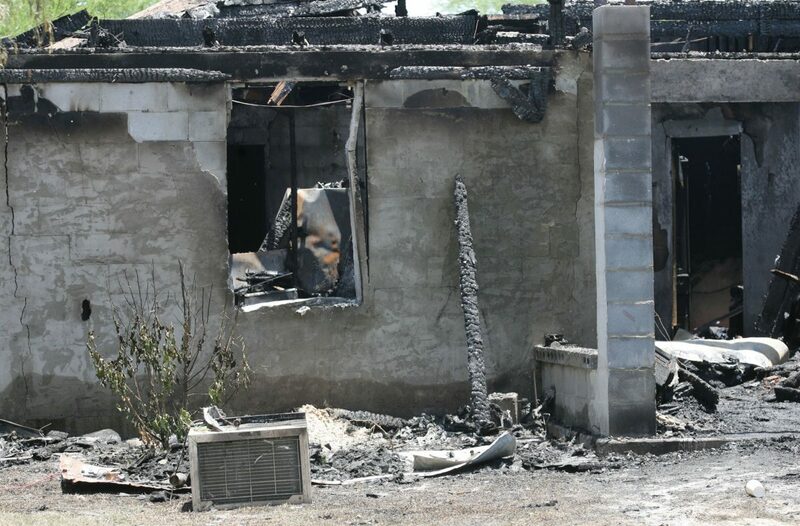 MISSION — Three people were killed and four more were injured in a house fire that broke out at approximately 2 a.m. Sunday here at 10900 Karen St., near Mile 9 Road and Bentsen Palm Drive. 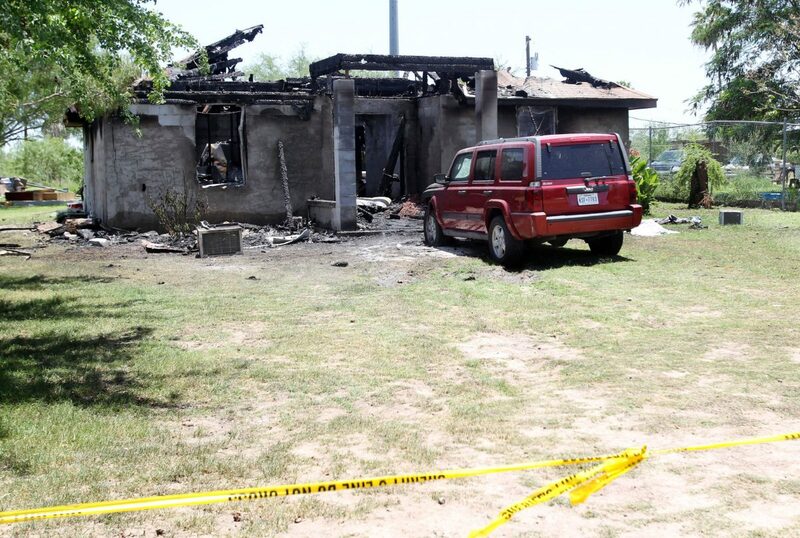 Maria Izabel Maldonado, 37, her 5-year-old son Gustavo Maldonado and 15-year-old Johnathan Palomarez, a family friend from La Feria, were killed in the fire, according to Hidalgo County Fire Marshal Department Investigator John Franz. Four others were injured in the blaze, including an adult male and a pre-teen boy, who were flown to the San Antonio burn clinic in critical condition. A 14-year-old girl and 5-year-old boy, believed to be the twin brother of Gustavo Maldonado, were transported to a local hospital to be treated. 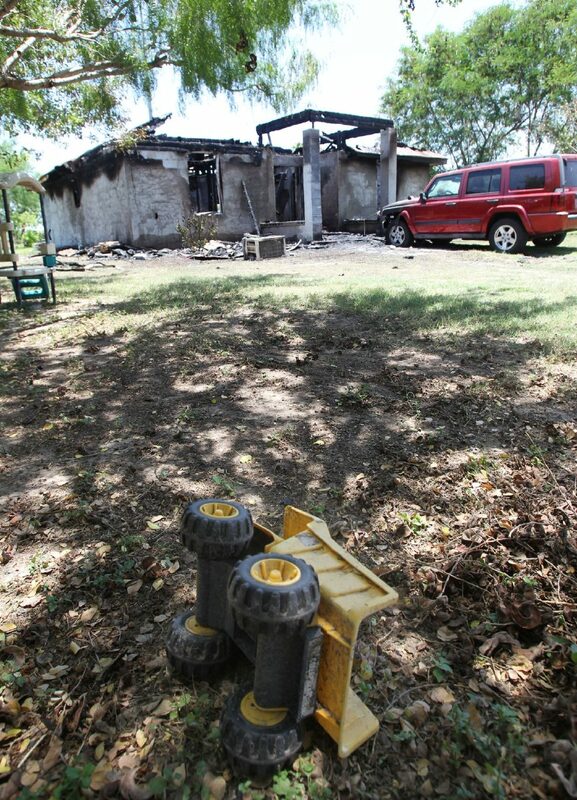 A toy is seen in the lawn of a family home that burned early on Sunday, July 21, 2018, in Mission. A 37-year-old mother, her 5-year-old son and a 15-year-old family friend died in the fire. Four others were injured and two were taken in critical condition to San Antonio. Police tape surrounds a home on Karen Street in Mission where three people lost their lives in an early morning fire on Sunday, July 21, 2018. Four others where sent to the hospital, two of them flown to San Antonio in critical condition. The fire is under investigation. The Hidalgo County Sheriff’s Department, the Alton Fire Department and McAllen Fire Department all responded to the three-bedroom, one bath home. While the home’s address is in Mission, it is within the Alton Fire Department’s jurisdiction, Franz said. Franz was quick to praise those who responded to the deadly inferno. The 14-year-old girl also saved one of the twins by handing him through a broken window to an Alton firefighter before she was rescued from the fire. “If it wasn’t for the quick reaction of those on the scene, I can guarantee you that there would have been four fatalities instead of three,” Franz said. “That sheriff’s deputy went through a window and stuck it out until the end and passed the person to a waiting firefighter. Franz added that the style of the home, constructed mostly of brick, made the fire hotter and deadlier. The home did not have any fire detectors. Franz also said that when a fire breaks out, while there are many people trying to help, it’s best that they wait for responders. “Fire detectors may have helped, so we want to remind everyone that if they don’t have them, to get them. For those who have them, check the batteries and test them on a regular basis,” he said. “Also, there are a lot of good Samaritans out there who sometimes do something that will make it inadvertently harder on us, like going and breaking windows to try to let smoke out.